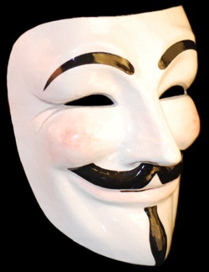 Embody one of the greatest conspirators of all time with one of our Guy Fawkes - Vendetta Mask - Authentic Hand Made Venetian Masks. 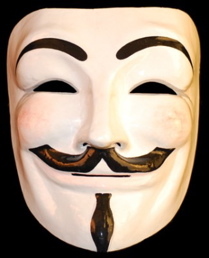 The Guy Fawkes masquerade masks originated in the 1600s, when Guy attempted to blow up the Houses of Parliament in London. 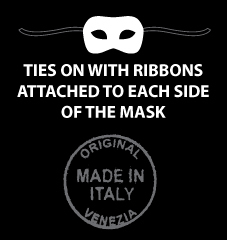 These stunning masquerade masks feature a full face pale toned mask with satin ties at the sides for a secure fit. With arched eyebrows, almond shaped eyes, a thin brown moustache, soul patch and upturned smile, people at the masquerade ball will ascertain that you are pretty proud of your exploits. Guy Fawkes Venetian masks also make quite the impression during Carnivale celebrations or Mardi Gras events.Create your own unique masquerade costume by adding a plush black, red, or blue hooded cloak made by Venetian Mask Society. Copyright 2014 VenetianMaskSociety.com. All Rights Reserved.